Malone’s Rory Campbell and Banbridge’s Andrew Morrison were the toast of Ulster club rugby last night at the annual Ulster Bank All Ireland League awards. Campbell was named Ulster Bank Division 2A player of the year by the panel of judges, receiving his award from Ireland head coach Joe Schmidt. And Morrison, while just missing out on the Division 1a player of the year accolade at last night’s gala event in the Aviva Stadium, picked up the popular Ulster vote and named provincial player of the season. Omagh’s Stuart McCain and Rainey’s Tommy O’Toole had also received nominations for the respective players of the year in Divisions 2C and 2B. And Queen’s University;s Chris Moore was among those nominated for the Club PRO of the year. Carol McMahon, Head of Business Marketing & Sponsorship, Ulster Bank said: “Ulster Bank is extremely proud to support grassroots rugby in Ireland. “We understand the commitment and dedication that players, coaches and volunteers give to make their club the best it can be. “All the nominees tonight are testament to the outstanding talent which has been displayed on countless occasions in clubs across the country throughout the season. 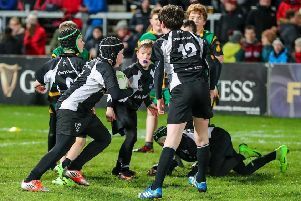 IRFU President Philip Orr commented, “The Ulster Bank League allows clubs to showcase their talent, their communities and the values rugby represents. Neil Cronin who earned himself a Munster contract ahead of next season on the back of his performances with Garryowen FC this season capped off an incredible year being named the Division 1A Player of the Year. Cronin who also captained the Ulster Bank Club international team this year was also awarded the Munster Player of the Year. Liam Coombes ensured a successful evening for Garryowen FC claiming the Top Try Scorer in Division 1A with 11 tries.